The first perfume I bought from The Body Shop was called Neroli Jasmine, and after getting through two or three bottles of it then sort of 'forgetting' about it for a year or so, I was heartbroken when I found that they had discontinued it. Then, a few months ago, while browsing in a Body Shop store, I tried out the Indian Night Jasmine perfume and was delighted to find that this was almost a revamped version of my beloved Neroli Jasmine, with different packaging and a different name, but with a very similar scent. 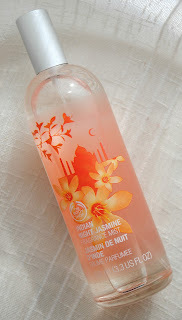 Nonetheless, Neroli Jasmine is no longer available (at least not in the UK), and I think Indian Night Jasmine makes for a good replacement. I opted for the fragrance mist version rather than the eau de toilette or eau de parfum as this was the largest bottle. You get excellent value for money with this product (£7.50 for 100ml), and the only real downside is that the scent is slightly weaker and doesn't last as long, but these are minor issues. The scent itself is unusual and mature, and it's one of those smells you just want to bury yourself in (I may or may not spend a little too much time nuzzling my nose into my scarf/shirt or sniffing my wrists when I wear this), and I often get compliments when wearing it. The advantage of using a mist rather than an actual perfume is that you can build the fragrance, so you can make is as strong or as subtle as you like. Wearing this always makes me feel very feminine and sophisticated, and anything that does that goes down well in my books. If you are looking for an affordable but beautiful fragrance that is very wearable and doesn't smell too synthetic or sickly, or if you too adored Neroli Jasmine and would like to try something similar, I would definitely recommend this. All of The Body Shop's products are great, and many of their perfumes are available in different strengths, as well as in shower gel and body lotion form.